Here are some firsts from the new garden. I just love seeing the new flowers come into the garden. 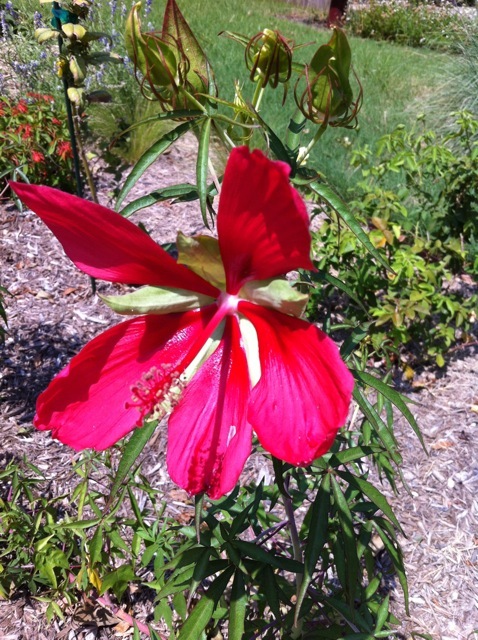 Texas hibiscus is supposed to be a profuse flowerer. 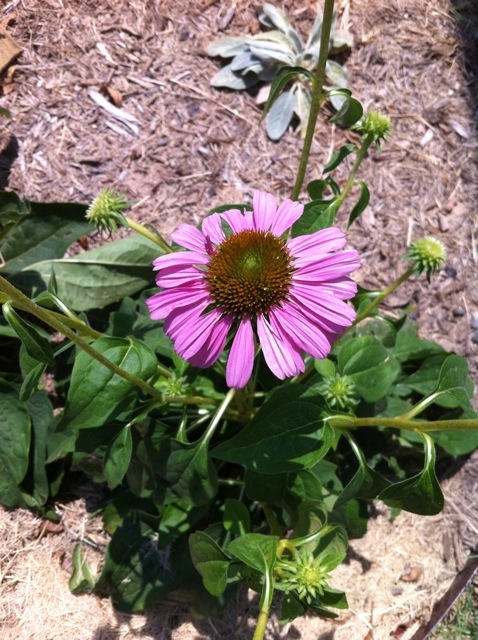 Purple coneflower often has flowers into the Fall. These photos were taken on September 8, 2012, about 2.5 months after these plants were put into the ground. Texas Heartleaf Hibiscus, First Flower (above). Flowers on this plant last only 1 day on average. But the blossom generously. 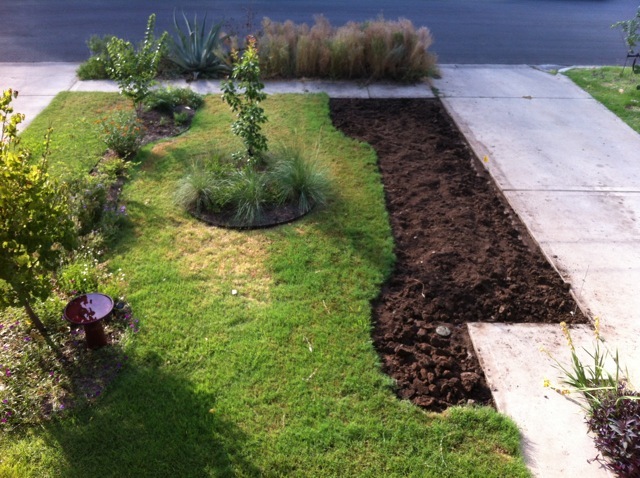 In March, I wrote about solarizing a new planting bed in the front of my house. In that post, I described with pictures our process of scalping the lawn, watering the area, and covering it tightly with plastic (black or clear is fine; generally clear is better). I put the plastic down around mid-March and it lasted just fine through June. Occasionally a blade of grass might poke a hole through the plastic (didn’t know grass was that sharp!) but I would just readjust the plastic and put more rocks down on that area to cover the hole. In June, I finally had time to tackle the bed. The first job was figuring out what I was going to plant. 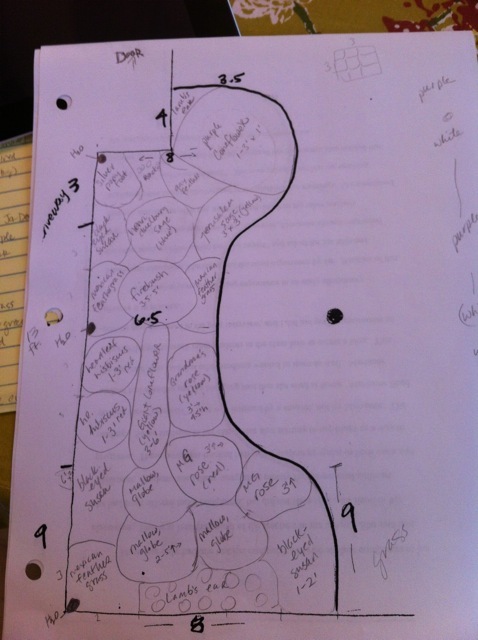 I had measured out the front yard and made a paper layout of the garden bed, to size, so I knew how many inches equaled a foot of space. I read up about native plants, pouring through resources I have, books, and checking against LadyBird Johnson Wildflower Center’s native plant database. I considered the plants that were already planted in the front yard on the other side as I hoped to create some symmetry of color. I also wanted a little bit of height, but not as tall as a tree because this bed sits immediately in front of the front door of the house. I did not want to block the sight-line of the front door from the stree/sidewalk with a tree. The area is in full-sun, so I had to choose plants that could withstand the heat. Once I had my plan, I decided that this time I’d hire some strong people to dig out the dead grass for me. I killed myself the last time and my husband was not too keen on doing it either. What a good decision! 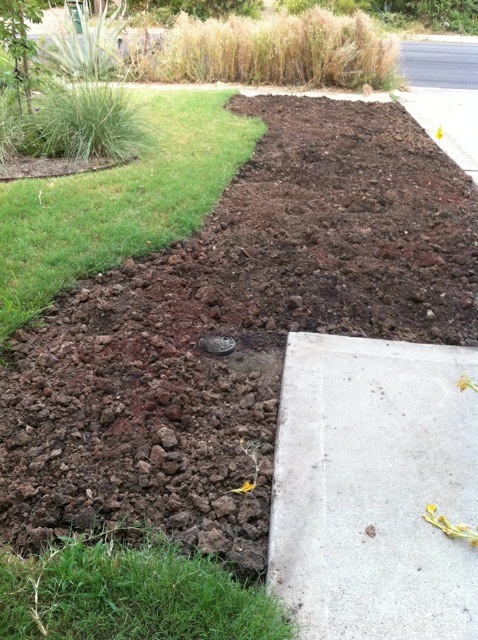 It took 2 men about 2 hours to completely dig out the grass and turn the soil a bit. 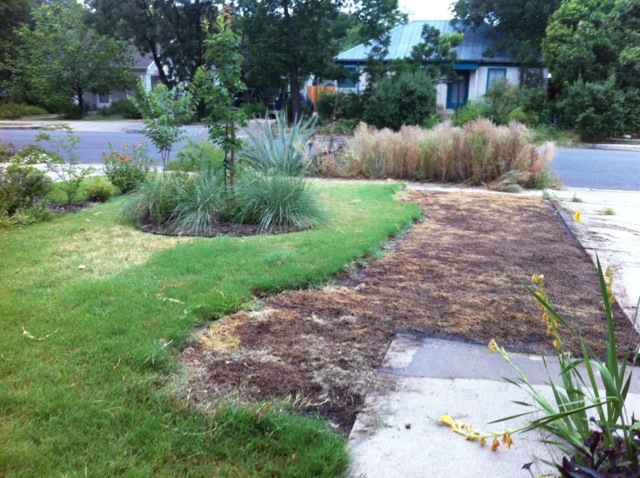 Here’s what the area looked like when we removed the plastic and after the dead grass had been dug up. After the hired guys dug through and rid the area of most grass, I went through and broke up big pieces of dirt and also checked for grass roots (they are so invasive!). We added a lot of compost, green sand, and corn gluten as I recall. We raked the amendments into the soil, catching more pieces of grass root. 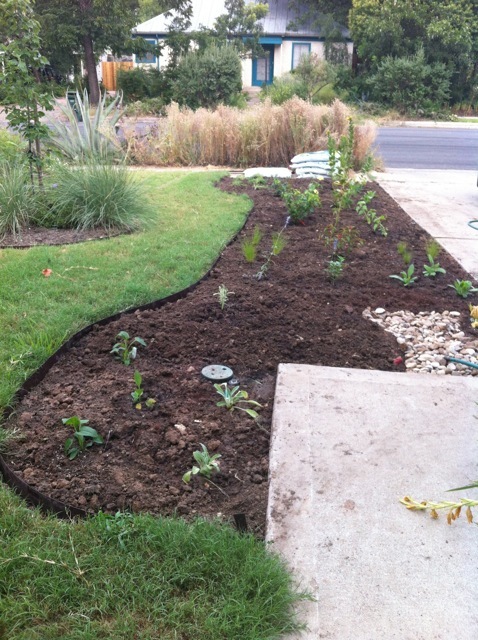 My husband installed edging along the grass side of the bed in order to reduce the invasion of grass, which is inevitable. We had this work done on Saturday. After the bed was prepped, I went out and bought my plants and planned to plant on Sunday after the sprinklers had moistened up the soil. Planting was super fun! I bought all 4″ pots if I could find them. The plants grow SO fast – there is no need to buy bigger plants unless you are impatient. The roses were a splurge and I did buy larger roses. 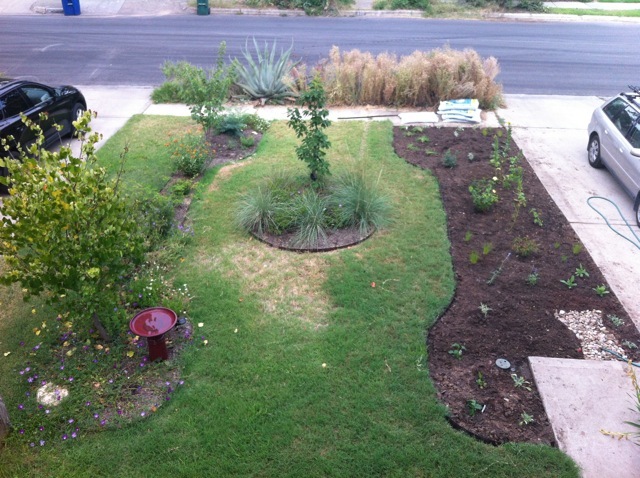 Here are the pictures of the garden planted in mid-June. Symmetry in the beds at last. Getting closer to my semi-formal garden. 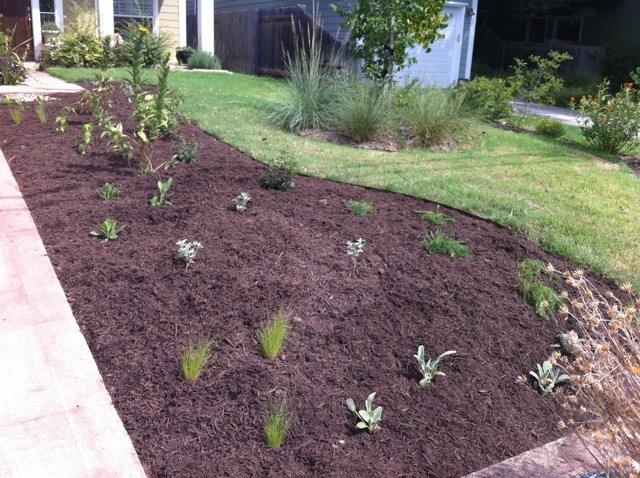 The last task, of course, was to put mulch around all the plants and on the bed to reduce weeds and to retain moisture. Lucky for us, Home Depot had a great sale on mulch. I also designed in a small, dry creekbed. On the other side of the sidewalk (not in picture), a gutter downspout had typically dumped water onto the driveway which flowed to the street. I added a different endpiece and now the downspout dumps water onto the sidewalk that flows into the small creekbed within the planting area. Silver ponyfoot is planted at the right corner of the sidewalk/driveway near the creekbed.